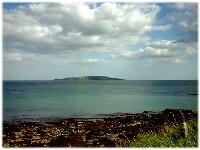 The rocky coast of Lambay Island, six miles out to sea is a popular place for Loughshinny fishermen to fish for crab and lobster. The island is almost one square mile in area and its highest point is Knockabawn, which reaches to 500 feet. The Irish name for the island is 'Reachra' and on Ptolemy's map (1st Century AD) it was called 'Limnus'. In 795 the island was the first place in Ireland to be attacked by marauding Viking raiders from the Isle of Man. After the Williamite Wars (1690 - 91) the island was used as a prison camp for the whole garrison of the Earl of Tyrconnell's 1,040 men. Over half of the men died due to severe winter conditions. The survivors had to sign an oath of allegiance to the King before they were released. In 1803 the Talbot family of Malahide bought the island with the intention of keeping it for private seal hunting. In 1905 Lord Revestoke, a merchant Banker, whose family name is Baring, acquired the island for his private use. He commissioned his friend Sir Edwin Lutyens (who designed the city of New Delhi in India) to design a neo-gothic Castle which still stands today. It is the only building (apart from the War memorial at Island Bridge Dublin) designed by Lutyens in Ireland.